By executing the In A Pikle, LLC. Independent Distributor Account Application and Agreement (“Application and Agreement”), you apply for legal authorization and enter into contract with In A Pikle, LLC. (“IAP” or “Company”). You have read and agree to all terms and conditions set forth in this Independent Distributor Account Application and Agreement. At the sole discretion of IAP, this agreement may be amended from time to time, and shall be collectively referred to as the (“Agreement”). IAP may accept or reject any application, including my application, for any or no reason. You may cancel this transaction without penalty or obligation within THREE BUSINESS DAYS from the date you signed this Application and Agreement (or within five business days if you reside in Alaska, fifteen days if you reside in Montana or Wisconsin, and thirty days if you reside in Kentucky). To cancel, please mail a written notice of cancellation – (stating you desire to cancel this transaction) – to: In A Pikle at: PO BOX 107 – Hooper, UT 84315, or email us at customerservice@inapikle.com, no later than midnight of the applicable day (3, 5, 15 or 30, depending on where you reside) following the date you signed this Application and Agreement. If notice is mailed, it will be effective as of the date the notice is postmarked. You may also cancel your agreement with IAP for any reason at any time by providing written notice to IAP in the same manner as stated above. Any purported modifications to the Agreement, including these terms and conditions, by an applicant, any other person other than IAP (as set forth in official IAP published notices) are automatically rejected by IAP, and are of no force or effect. Agreement, including these terms and conditions, shall remain as if no modifications were made. You may not assign any rights or delegate your duties under the Agreement without the prior written consent of IAP. Any attempt to transfer or assign the Independent Distributor Account Application and Agreement without the express written consent of IAP, renders the Agreement voidable at the option of IAP, and may result in termination of your Account. You agree that as an Independent Distributor, you are not an employee, partner, legal representative, or franchisee of IAP. You agree that you will be solely responsible for paying all expenses incurred by yourself, including, but not limited to travel, food, lodging, secretarial, office, telephone and other expenses. YOU UNDERSTAND THAT YOU SHALL NOT BE TREATED AS AN EMPLOYEE OF IAP FOR FEDERAL OR STATE TAX PURPOSES, NOR FOR PURPOSES OF THE FEDERAL UNEMPLOYMENT TAX ACT, THE FEDERAL CONTRIBUTIONS ACT, THE SOCIAL SECURITY ACT, OR ANY STATE UNEMPLOYMENT ACTS, STATE EMPLOYMENT SECURITY ACTS, OR STATE WORKERS COMPENSATION ACTS OR ANY OTHER STATE OR FEDERAL LAWS, STATUTES OR REGULATIONS APPLICABLE TO EMPLOYEES. You agree to pay any and all taxes and/or fees that may result from your activities under the Agreement. IAP is not responsible for withholding, and shall not withhold or deduct FICA, or other taxes of any kind. You understand that you may not use or attempt to register any of the Company trade names, trademarks, taglines, service names, service marks, product names, symbols, designs, the Company’s name, or any derivative thereof, confusingly similar to and / or implied, for naming a Business Entity, Internet domain name, and creating any electronic mail address unless prior written approval is granted by IAP. MINIMUM ORDER REQUIREMENT: You will have a Minimum Order Requirement to purchase products, and all minimums are calculated on the “retail” volume. As of April 1, 2019, thresholds as stated below will be put into place. You understand that the acceptance of this Agreement by IAP does not constitute the sale of a franchise or business opportunity under any state or federal law and that there are no exclusive territories granted to anyone. You also understand that you are not acquiring any interest in a security. You understand that successful sale of IAP product(s) is not guaranteed in any way and requires, among other things, hard work, dedication, and sales skills. You agree to refrain from presenting the IAP opportunity as a passive investment program or passive source of income or from making any claims that state or imply that Distributors have exclusive territories.SHIPPING HANDLING: You understand that items will not be shipped until full payment is received. No COD orders. We use USPS and UPS Ground shipping, based on cost affordability, unless you specify/request a quicker mode of shipping. On all orders, we include the cost of packaging materials and handling fees in your shipping total. SALES TAX: Sales Tax will be collected at point of sale for UTAH shipping addresses only. Products shipped to any other state will NOT be charged sales sax at the point of purchase. IT IS YOUR SOLE RESPONSIBILITY FOR KNOWING IF YOU QUALIFY TO CLAIM EXEMPTION FROM THE TAX IN THE STATE THAT IS DUE TAX ON THIS SALE AND / OR ULTIMATE RESALE. YOU WILL BE HELD LIABLE FOR ANY TAX AND INTEREST, AS WELL AS CIVIL AND CRIMINAL PENALTIES IMPOSED BY THE MEMBER STATE, IF YOU ARE FOUND NOT ELIGIBLE TO CLAIM THIS EXEMPTION. IAP SUGGESTS THAT YOU ENSURE YOU ARE IN COMPLIANCE WITH YOUR STATE TAX REQUIREMENTS WHEN RESELLING IAP PRODUCTS. THIS MAY INCLUDE, BUT IS NOT LIMITED TO, SPECIFIC LICENSING REQUIREMENTS, PERMITTING FEES AND SALES TAX EXEMPTION CERTIFICATES, etc. ***EXCEPTION: Utah placed orders shipped to a Utah mailing address may be required to provide an Exemption Certificate at the sole request and discretion of IAP. VENDOR EVENTS: If you choose to participate in vendor events and/or shows, you are encouraged to contact your State to apply for proper documentation for this event, including but not limited to, temporary sales tax license. MSRP: Products or goods purchased from IAP should be not be advertised for less than 15% below the manufacturer’s suggested retail price (MSRP). In the rare event that a Company sponsored promotion is advertised below 15% (i.e. clearance of discontinued items), Independent Distributors may sell and advertise merchandise to match current Company promotions. Permission for special sales events below current advertised price, must be requested in writing to IAP and will typically be granted on a semi-annual basis. Violation of MSRP may result in termination of your Independent Distributor Account Agreement. WEB COMMERCE: You understand that you may not use or attempt to register any of the Company’s trade names, trademarks, taglines, service names, service marks, product names, symbols, designs, the Company’s name, or any derivative thereof or confusingly similar to and / or implied, for any Internet domain name or any electronic mail address unless prior written approval is granted by IAP. IAP has the sole right as follows: 1) to determine whether any domain name, content or e-mail address violates this agreement, and 2) to withhold approval. Use of IAP trade names, trademarks, taglines, service names, service marks, product names, symbols, designs, copyrights, patents, other intellectual property or the Company’s name, or any derivatives thereof or confusingly similar to, on any item, article, product or merchandise not produced or specifically approved and authorized by the Company is prohibited. No products or goods purchased from IAP shall be resold by or through any personal and / or auction or online store(s) (such as Ebay, Craig’s List, Amazon, similar sites or any other website) without the express, written permission of IAP. IAP, in its sole discretion will determine what is defined as a personal and / or online auction site/store and may terminate this agreement immediately should the need arise. Independent Distributors shall not create, design or manage a static website that solely uses the names, logos, products or product descriptions of IAP or promotes (directly or indirectly) IAP products or the IAP opportunity as its own. 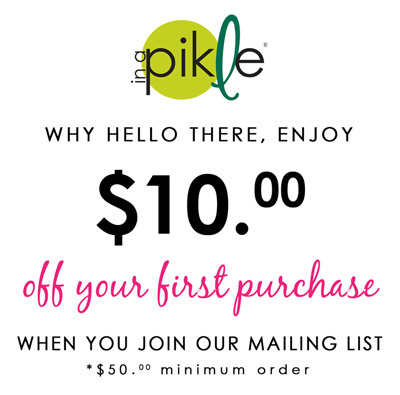 “In A Pikle” Independent Distributors must identify themselves as such when promoting, marketing and/or creating personal and unique business opportunities, including but not limited to social media, websites, and in-person and other efforts. PRODUCT IMAGES: IAP is not required to provide any sales aids, marketing materials, product displays, etc., Purchase of these, and any additional items shall be at your own expense. At the sole discretion of IAP, the company may make available images that you may use for your print and online presence. Should you require any additional images, please contact us at customerservice@inapikle.com. (Please allow adequate lead-time for response/approval; two weeks is recommended). When marketing the products, you may not use pictures, graphic displays, written materials, or make any claims about IAP products not contained in official IAP sales and promotional literature, unless otherwise authorized in advance by IAP corporate. Independent Distributors must add their title, “In A Pikle” Independent Distributor, with name and business information to approved IAP images. If IAP deems any images, slogans and/or marketing materials inappropriate, IAP reserves the right to cancel this agreement in their sole discretion. RESELLING TO WHOLESALE ACCOUNTS: Any Independent Distributor Account who distributes IAP goods and products to any entity for resale must require their customer to strictly adhere to these same Account guidelines. Any Independent Distributor who does not enforce these guidelines with their own resale customers will be subject to termination of this agreement. PAYMENT METHODS: At this time, IAP is not extending credit terms. All orders must be accompanied by pre-payment. We accept credit card payment online via our website. IAP does not accept checks. CUSTOMER CONCERNS, GRIEVANCES AND/OR DISPUTES: IAP will review all customer concerns, grievances and/or disputes and, agrees to notify the applicable Independent Distributor in writing of such. *IAP expects all Independent Distributors to act immediately to find satisfactory customer resolution. If resolution cannot be found, and IAP finds any product misrepresentation and/or delivery deficiency, the Independent Distributor Account Agreement will be canceled and Independent Distributor will be charged in full for the amount of the concern, grievance and/or dispute, including any legal fees as related. RETURNS/EXCHANGES: You are responsible to examine your product upon receipt. If you are not completely satisfied with your purchase, you may return it within 15 days from date of purchase for a full refund, excluding shipping and handling charges. You are responsible for shipping method, handling, and fees associated with returning the product to us. Original shipping and handling charges are non-refundable. We would be happy to refund your shipping costs upon return if the item is damaged or defective. All refunds will be calculated using standard shipping rates, regardless of the shipping method chosen for return. Please contact customerservice@inpikle.com for returns and/or exchanges. AUTHORIZED COUNTRIES: You agree to sell and promote products and services available through IAP in authorized countries and territories, and in authorized manners. Customer is responsible for all duties, taxes and fees associated with doing business in your country. FAILURE TO COMPLY: You understand that if you fail to comply with the terms of the Agreement, IAP may, in its sole discretion, terminate the Agreement, and bring an action before the courts seeking a restraining order, temporary or permanent injunction, or other equitable relief to protect its intellectual property rights, including but not limited to, customer and/or distributor lists as well as other trade secrets, confidential information, trademarks, trade names, patents, and copyrights. If your Account is canceled or terminated by IAP for any reason, you will lose the rights under this current agreement and such re-enrollment may be subject to additional terms and conditions at IAP’s discretion. AMENDMENTS: You understand that these Terms and Conditions may be amended at the sole discretion of IAP at any time and you agree to abide by all such amendments. Notification of amendments shall be published via email and/or corporate website and will be effective as of the date set forth in the publication. Your sole remedy for refusing any amendment(s) is to cancel the Agreement.\The effective date of the Agreement will be the date it is accepted by IAP and, electronic acceptance has been issued. IAP may accept or reject any application, including my application, for any or no reason. LEASE OF MEETING OR OFFICE FACILITIES, ETC. ), AND AGREE TO INDEMNIFY AND HOLD HARMLESS IAP AND ITS AFFILIATED PERSONS FOR ANY AND ALL LIABILITY, DAMAGES, FINES, PENALTIES, OR OTHER AWARDS ARISING FROM ANY NEGLIGENCE AND UNAUTHORIZED CONDUCT THAT YOU UNDERTAKE IN OPERATING YOUR BUSINESS. You agree that upon your breach of the Agreement, IAP will be immediately and irreparably harmed and cannot be made whole solely by monetary damages. You further agree that the remedy at law for any breach of any provision of the Agreement shall be inadequate; and that in addition to any other remedies, in law or in equity it may have, IAP shall be entitled, without the necessity of proving actual damages or posting bond, to temporary and permanent injunctive relief to prevent the breach or threatened breach of any provision of the Agreement and/or to compel specific performance of the Agreement. To facilitate your on-going relationship with IAP, and to further mutual interests, YOU EXPRESSLY GRANT TO IAP THE RIGHT TO MAKE, AND YOU CONSENT TO RECEIVE, UNSOLICITED AND CONTINUED COMMUNICATIONS, INCLUDING VIA EMAIL, TEXT, TELEPHONE, FACSIMILE AND ANY OTHER WRITTEN OR ELECTRONIC COMMUNICATION. YOU SPECIFICALLY CONSENT TO RECEIVE, AT THE TELEPHONE NUMBER YOU PROVIDE, LIVE AND/OR PRE-RECORDED MESSAGES FROM OR ON BEHALF OF IAP REGARDLESS IF SUCH PHONE NUMBER IS OR BECOMES PART OF ANY STATE OR FEDERAL “DO NOT CALL” LIST. YOU HAVE THE RIGHT TO OPT OUT AT ANY TIME. You represent and warrant that the contact information you provide is accurate, your own and that you will maintain correct and updated contact information throughout the term of your relationship with IAP. The Agreement will be governed by and construed in accordance with the laws of Utah without regard to principles of conflicts of laws. All disputes and claims relating to IAP, the Agreement, or IAP’s products or services, the rights and obligations of an Independent Distributor and IAP, or any other claims or causes of action relating to the performance of either an Independent Distributor or IAP under the Agreement may be settled totally and finally by arbitration in Salt Lake City, Utah or such other location as IAP prescribes. All issues related to arbitration shall be governed by the laws of the State of Utah. The decision of the arbitrator shall be final and binding on the parties, and may, if necessary, be reduced to a judgment in any court of competent jurisdiction. This agreement to arbitrate shall survive any termination or expiration of the Agreement. Nothing in the Agreement shall prevent IAP from applying to, and obtaining from, any court having jurisdiction a writ of attachment, garnishment, temporary injunction, preliminary injunction, permanent injunction or other equitable relief available to safeguard and protect its interest prior to, during or following the filing of any arbitration or other proceeding or pending the rendition of a decision or award in connection with any arbitration or other proceeding. The prevailing party shall be entitled to receive from the losing party costs and expenses of arbitration or litigation, including legal and filing fees. You consent to jurisdiction and venue before any courts in the State of Utah for purposes of enforcing an award by an arbitrator, or any other matter not subject to arbitration. If an Independent Distributor wishes to bring an action against IAP for any act or omission relating to or arising from the Agreement, such action must be brought within one year from the date of the alleged conduct giving rise to the cause of action. Failure to bring such action within such time shall bar all claims against IAP for such act or omission. Representative waives all claims that any other statutes of limitation apply. The terms and conditions of the Agreement apply to all those obligations that survive or would typically survive any cancellation, expiration, termination, or rescission, including, without limitation, covenants and obligations of Applicant to abide by any non-solicitation, non-competition, trade secrets, and confidential information covenants contained in the Agreement shall survive termination of the Agreement. Montana Residents: A Montana resident may cancel his or her Independent Distributor Representative Account Agreement within 15 days from the date of enrollment, and may return his or her product and/or marketing materials for a full refund within such time period. The Agreement, in its current form and as amended by IAP at its discretion, constitutes the entire contract between IAP and you and/or your business entity. Any promises, representations, offers, or other communications not expressly set forth in the Agreement are of no force or effect. Any waiver by IAP of any breach of the Agreement must be in writing and signed by an authorized officer of IAP. Any waiver by IAP of any breach of the Agreement shall not operate or be construed as a waiver of any subsequent breach. If any provision of the Agreement is held to be invalid or unenforceable, such provision shall be reformed only to the extent necessary to make it enforceable, and the balance of the Agreement will remain in full force and effect. This Agreement may be executed electronically, and may be delivered to IAP by facsimile or other electronic means and IAP will rely on the receipt of such document as if the original had been received. To promote and sell “In A Pikle” Products to retail customers. To build professional consumer relationships by providing customers an invoice, supporting inquiries and assisting with product satisfaction to your customers. To maintain the highest standards of integrity, honesty and responsibility in dealings with the Company, consumers and other Independent Distributors. To represent the products in a truthful manner. and hold the Company harmless from damages resulting from misrepresentations. To protect the “In A Pikle” trademarks and trade names. To obtain written permission from the Company prior to modifying advertising materials provided or using outside advertising, excluding personal social media endorsements (i.e. #pikleprops). To assume sole liability for all self-employment (Social Security), income taxes, and other reports required by my activities as an Independent Distributor. To abide by all federal, state and local laws governing my “In A Pikle” business. To release my name and telephone number in response to a customer’s request for an Independent Distributor in my area. If this information is not to be released, I agree to notify the Company that I do not want this information released by written notice to customerservice@inapikle.com. To advertise products no less than 15% below MSRP or at the Company’s current advertised price, whichever is lower in accordance with the Terms and Conditions. To comply with any changes to the General Terms and Conditions to the Independent Distributor Account Agreement that may be made by the Company. To represent myself as an Independent Distributor and not “In A Pikle” (the Company). To refrain from advertising, slander, or defamation that would be deemed damaging to the “In A Pikle” Company, it’s owners, or brand. To guide the company in conjunction with safeguarding the good reputation of the IAP brand and its products. To set a standard for acceptable business conduct and ensure compliance with all of the terms and conditions set forth in the Agreement. To provide adequate information relating to IAP products, (ie: contents, packaging, descriptions, etc.). To provide support in the form of frequent updates, information (where applicable) and prompt response to inquiries from Independent Distributors. To give Independent Distributors at least three (3) days’ notice if changes to the retail prices, discounts, or terms and conditions occur. To provide products for online customers through marketing, promotions and incentives independent of the Independent Distributor Account Agreement. To provide suitable marketing images for use by the Independent Distributor to promote the “In A Pikle” products, and to promote brand awareness through all media platforms. To provide a corporate only, social media presence where Independent Distributors can gain ideas on what a social media presence could look like for their own business standards. To allow Independent Distributors to discount merchandise from the MSRP retail prices in compliance with the Terms and Conditions. To continue providing quality products, backed by a solid return policy. This Agreement is subject to acceptance by Company at its corporate headquarters in Utah, through issuance of a Notice of Acceptance. This Agreement shall be governed by the laws of the State of Utah as to all matters. The parties further agree that if any dispute or controversy arises between them concerning any matter relating to this Agreement that any issues which either party may elect to submit for legal jurisdiction shall be submitted to the jurisdiction of the courts of the State of Utah, and the parties agree that the proper venue shall be Salt Lake City, Utah. This Agreement is not subject to alteration, modification or change, except in writing, signed by an authorized executive of the Company, and shall not be deemed to be changed, modified or altered by reason of any advice, suggestions, guides or sales aids furnished by the Company to the Independent Distributor. This Agreement shall be effective from the date of acceptance until December 31 of the same year and shall thereafter be automatically renewed each January 1, for additional terms of one year each. Agreement may be terminated immediately for any breach of its provisions, or Independent Distributor. This is the sole and only Agreement between the parties relating to the subject matter hereof, and both parties acknowledge that the Independent Distributor is not an employee of Company, and will not be treated as an employee with respect to this Agreement for federal, state or local tax purposes, or otherwise.